Extreame Savings Item! Free Shipping Included! 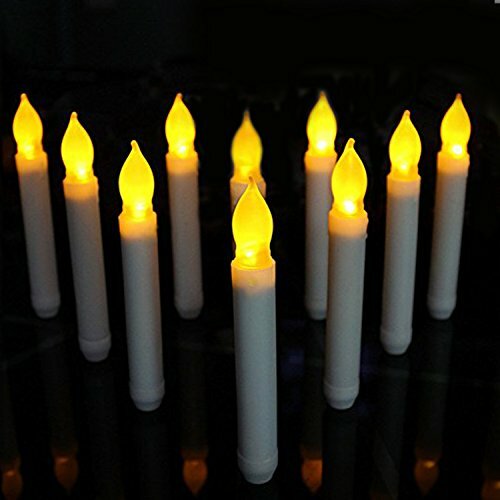 Save 45% on the Set of 24 Yellow Mini Battery Operated Wax Dipped White Body LED Taper Candles, Flameless Taper Candles for Wedding, Halloween, Thanksgiving -Batteries Not Included by Youngerbaby by Youngerbaby at Two Clock. MPN: CDL5019-L-24_GX. Hurry! Limited time offer. Offer valid only while supplies last. About LED Tape Candle with Light Bulbs Perfect for a rich holiday presentation, this taper candles is a great decorative accent in any space. View More In Candles - Page 9. Perfect for a rich holiday presentation, this taper candles is a great decorative accent in any space. Featuring a smooth body with some drip detailing and a warm flickering amber flame, these candles are the perfect head-turner whether scattered among table top wreathes or holding their own as the focal piece to a dining table set-up or mantle piece display. Unscrew ring at bottom of candle to insert batteries. Twist ring clockwise to turn candle on and counter-clockwise to turn off. 2.Flameless, smokeless and long lasting, safe to use. 5.Great for floral arrangements, weddings, home decor, churches, candle light vigils and more! If you have any questions about this product by Youngerbaby, contact us by completing and submitting the form below. If you are looking for a specif part number, please include it with your message.